The half-baked idea of floating a Federal Front of regional parties not only reflects the bankruptcy of its proponents, but also lays bare the naked opportunism and cynical manipulation of vote-bank politics by a ragtag group of non-Congress, non-BJP parties. The most comic element of the drama scripted by Trinamul Congress supremo Mamata Banerjee and then co-authored by two of her counterparts in Bihar and Odisha is that a side-show of the post-2014 Lok Sabha poll scenario ~ bargaining by fringe players ~ has begun much before the main show ~ emergence of the single largest winner. But what has prompted the Mamata Banerjee-Nitish Kumar-Naveen Patnaik troika to make such a strident pitch for a formation that lost its sheen years back? More importantly, why has the call for a Federal Front, which is but old wine in new bottle, been given by the Trinamul and immediately responded to by the JD (U) and the BJD? What is intriguing is that the original advocates of a third alternative have buried the political entity realising it is not feasible at the moment. Undoubtedly, it is the “Modification” of the BJP that has led to the mad rush for resuscitating the mummy of a Third Front and rechristening it. The answer to the riddle lies in the fact that each of the three parties has been at one time or the other a BJP ally. Their association with the BJP has been both an asset and a liability for them. They enjoyed power and the resultant benefits as part of the ruling NDA at the Centre. But at the same time, they had to let the stigma of being partners of the “communal” Hindutva party stick to them at a considerable cost. 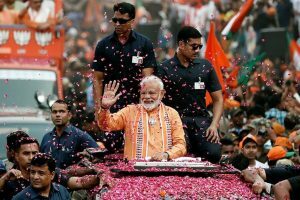 However, never before has the fear of being branded a collaborator of a rabidly communal force haunted the three “secular” parties so much as it does now after Narendra Modi was anointed chief of BJP&’s election campaign committee for 2014 Lok Sabha poll. to be the standard bearer of the proposed Front within days of Modi being made the virtual prime ministerial candidate for the BJP. The Trinamul chief&’s unstated political credo has thus far centred on forming an alliance with the Congress or the BJP, after judging which way the wind blows. When she found the Congress was ahead of the BJP in capturing power at the Centre, she teamed up with the party; when the BJP was in the driving seat in the race to Delhi durbar, she dumped the Congress to join hands with the BJP. This has been the trajectory of the Mamata brand of politics since the Trinamul was formed in 1998. The same pattern was repeated in the middle of the UPA-II government&’s tenure. She first joined the Congress-led UPA in 2009, when the Congress was in a position to form the government. However, when she found her alliance with the Congress might prove harmful to her political interests, she severed her ties with the party. Since then, she had been looking for an opportunity to come closer to the BJP and pursue her doctrine of embracing the Congress and the BJP alternately to suit her immediate political end. She couldn’t follow this dictum immediately after capturing power in Bengal in 2011 since she had won the Assembly election riding on the crest of a movement against land grab, in which a large number of Muslim farmers and landless labourers had taken part. Had she initiated any liaison with the BJP, she would have alienated about 24 per cent of the state&’s (minority) population. That would have been political harakiri. When the mother of all scams ~ the Saradha chit fund fraud ~ came to the fore a couple of months ago, it completely upset Trinamul&’s calculations. The scam affected the lives of lakhs of people from the lower income group especially in rural Bengal, considered the Trinamul&’s backbone. The association of several MPs and ministers of the ruling party with the chief of the Saradha group, Sudipto Sen, turned the Trinamul into the villain of the piece and a betrayer of the poor overnight. For, these leaders had let the swindler use the Trinamul-government as virtual collateral security to fleece money from the poor. Mamata Banerjee herself appeared to have given tacit support to the colossal fraud as one of her paintings was bought by the group for Rs 1.86 crore, though it would have fetched only a tiny fraction of the amount had it been put on sale purely on its merit. Following the Saradha fiasco, the Election Commission made things worse for Mamata Banerjee by announcing the date of the bypoll to the Howrah Lok Sabha seat even before the family of the deceased Trinamul MP could get over the initial grief. Trinamul faced its worst crisis since coming to power ~ a defeat in the bypoll would spell doom for the beleaguered party in the ensuing rural poll and the party was scared to the core. What happened behind the scene is in the realm of speculation, but it is a fact that the BJP&’s eleventh hour decision not to field its candidate for the bypoll even after announcing the name of the candidate eventually proved a blessing for the Trinamul. The Trinamul candidate won by about 27,000 votes, while the BJP had secured 39,000 votes in the 2009 Lok Sabha poll. Trinamul&’s lead margin was alarmingly lower than the 1.84 lakh votes that party candidates had bagged in the seven Assembly segments of the parliamentary constituency in 2011 poll. The implication was clear. When the Rajnath Singh-Mamata Banerjee axis was being formed dot by dot, Narendra Modi was elevated as the campaign committee chief, much to the consternation of the minority population. Mamata took even greater fright, for, any perceived association of her party with the BJP under Modi would be like the poisoned chalice to her lips. She couldn’t waste a minute with the rural population already much alienated in the wake of the Saradha scam. Hence, the dump-BJP as well as dump-scam-ridden Congress calls. Nitish Kumar has similar compulsions in Bihar, while Mr Patnaik has his ambition to be a national player and more importantly, he has to send the message across to his foreign friends that he would no longer be seen in the company of Narendra Modi; it was, after all, his company that tarnished Patnaik&’s image abroad post the Godhra carnage.